Attorney Peter Sanderson (Martin) loves his ex-wife (Smart), but doesn't know what he did to make her leave. Trying to move on with his life, he sets up a blind date online with a woman he believes to be a brainy, bombshell barrister. But when she shows up, it's Charlene (Queen Latifah) - a prison escapee who's proclaiming her innocence and wants Peter to help clear her name. The misunderstanding jeopardizes his efforts with his ex-wife and a billion dollar client, but Charlene wants to help. 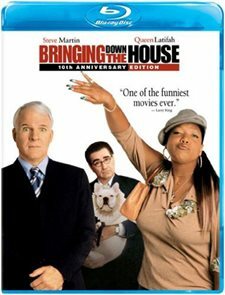 Download Bringing Down The House in Digital HD from the iTunes store. Bringing Down The House images are © Touchstone Pictures. All Rights Reserved.